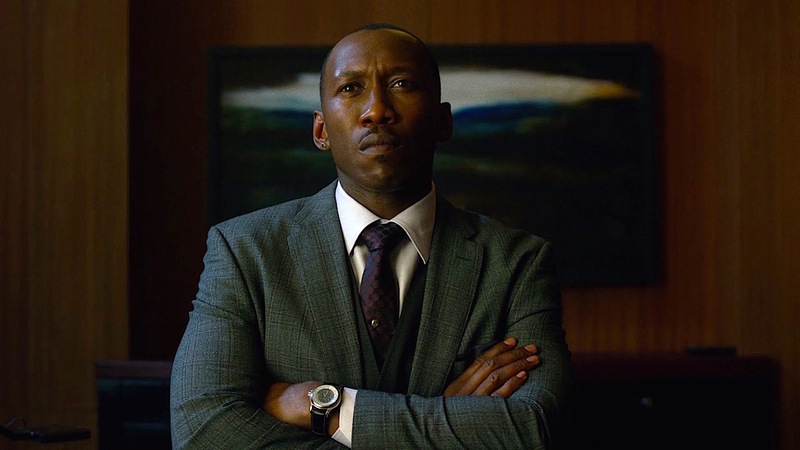 BAMF Style’s focus on first episodes during this first week of fall continues with a look at the well-suited villain Cornell “Cottonmouth” Stokes on Netflix’s Luke Cage, played to charismatic perfection by Academy Award winner Mahershala Ali. 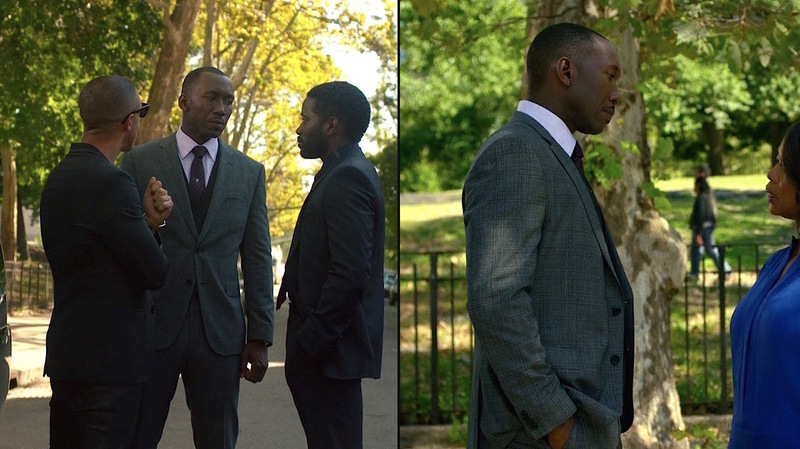 Cornell Stokes dresses for a day that takes him from the office out onto the street in a sharp gray plaid worsted two-piece suit with pick stitching. The suiting consists of a dark plaid with a pink overcheck on a mid-gray ground. The plaid suiting includes a light pink overcheck that nicely picks up the pink of his shirt as well as the large purple dots on his tie. 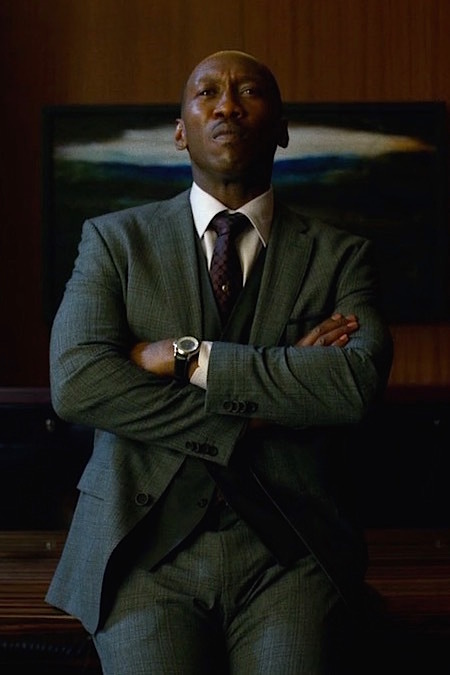 Cornell’s single-breasted suit jacket has slim notch lapels that roll to two black buttons that match the “kissing” four buttons on each cuff. The jacket has double vents, straight flapped hip pockets, and a welted breast pocket where he wears a purple silk pocket square folded neatly and just barely visible over the top of the pocket. 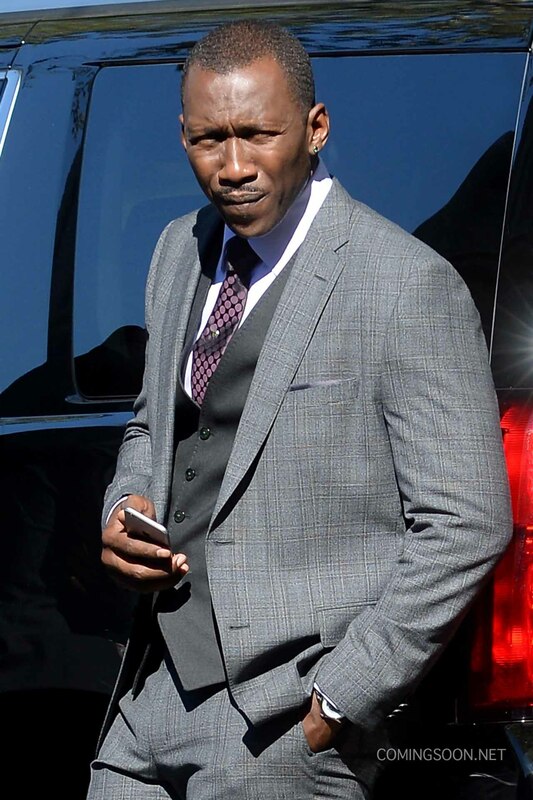 Best seen when Cornell wears his jacket buttoned, the suit jacket is tailored with a classic drape cut to emphasize Mahershala Ali’s strong physique and the character’s imposing presence. 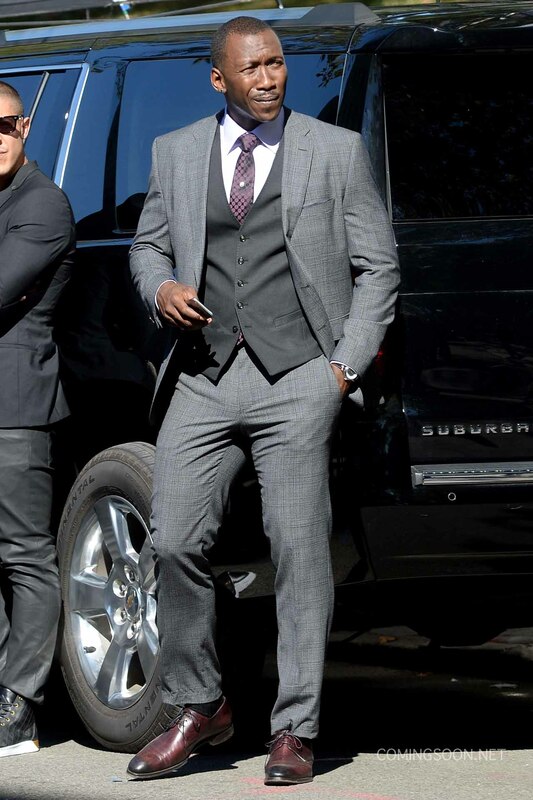 Cornell Stokes owns a few sharp three-piece suits, but he also utilizes an odd vest to add an extra layer to his two-piece suit. 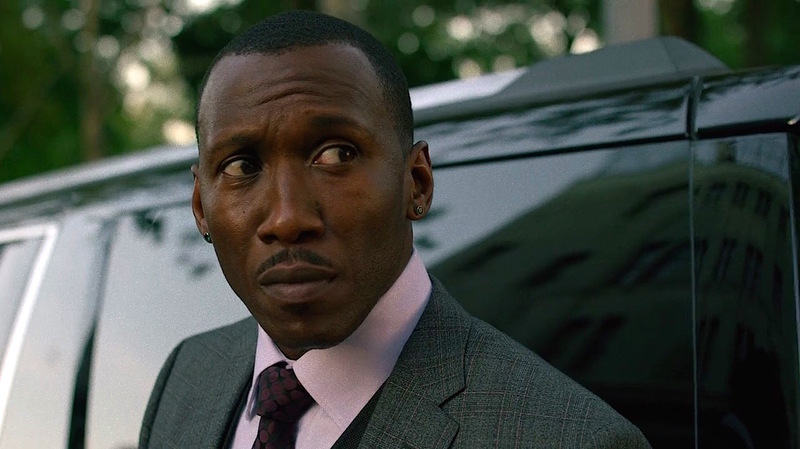 In this context, “odd” refers only to the fact that the vest is non-matching; a plain black waistcoat like Cornell’s is as far from the other definition of “odd” as it gets! Cornell wears a black twill vest with five black buttons, correctly leaving the bottom button undone over the notched bottom. The vest has three welted pockets: one on the left breast and two lower pockets. The shiny black back lining slightly tapers toward the bottom and has an adjustable fabric strap across the lower back. Once it’s covered in blood, Cornell’s black vest satisfies all definitions of “odd”. Cornell’s flat front suit trousers have a low rise that contrasts against the better-fitting jacket, though this lower rise trouser is consistent with trendy men’s fashion of the mid-2010s. The waistband is fitted with buckle-tab adjusters on the right and left sides. The trousers have slightly slanted side pockets and two button-through back pockets. The bottoms are plain-hemmed. The low rise of the trousers make them appear dangerously close to slipping off while Cornell conducts some dirty business in his office. 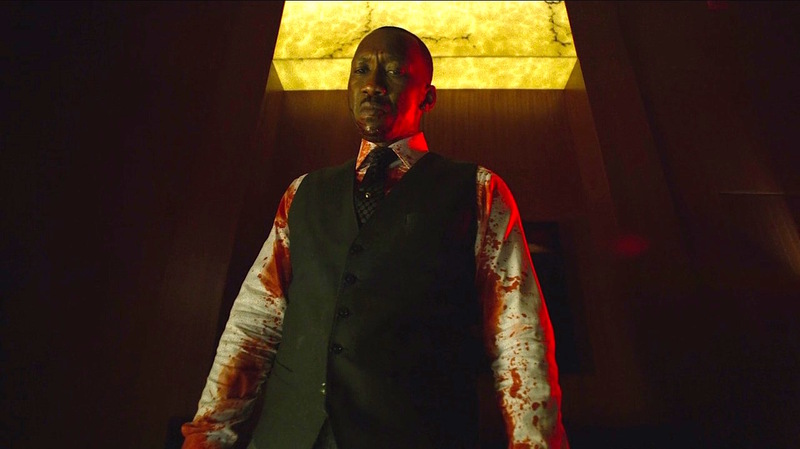 Unfortunately for Cornell (but more unfortunate for Shameek), his gray plaid suit and his black odd vest are ruined when they are covered with blood that evening in his office, making “Moment of Truth” the sole episode to feature this outfit. Cornell wears a distinctive pair of burgundy cordovan derby shoes with black-stained plain toes, sported with a pair of black cotton lisle socks. A fine pair of burgundy three-eyelet plain-toe derbies by British luxury shoemaker George Cleverley popped up for $1,425 but without the blackened toe box. On the other end of the price spectrum, I found a similar-looking pair of burgundy derbies at ZLAY for $98, but I can’t speak to the quality… particularly when compared against Cleverley. The burgundy shoes coordinate well with the pinkish tones of the outfit, particularly the light pink herringbone cotton dress shirt. Cornell’s pink shirt has a large collar with considerable spread, a plain front with no placket, and mitred cuffs that he unbuttons when he rolls up his sleeves to play his Rhodes piano. A contemplative evening in his office calls for the first of Cornell’s several virtuoso moments on his Fender Rhodes. Cornell’s silk tie is a field of large purple dots on a field of black, tied with a Windsor knot and fastened into place with a gleaming stickpin. Based on Maslansky’s comments to Esquire, the tie is likely from Dolce & Gabbana or Ermenegildo Zegna. Cornell wears a polished steel wristwatch on his left wrist with a stainless case and a black leather strap. The dark blue dial has a white outer ring that may help identification. On the opposing hand, he wears a silver ring with a set-in round blue stone on his right pinky. 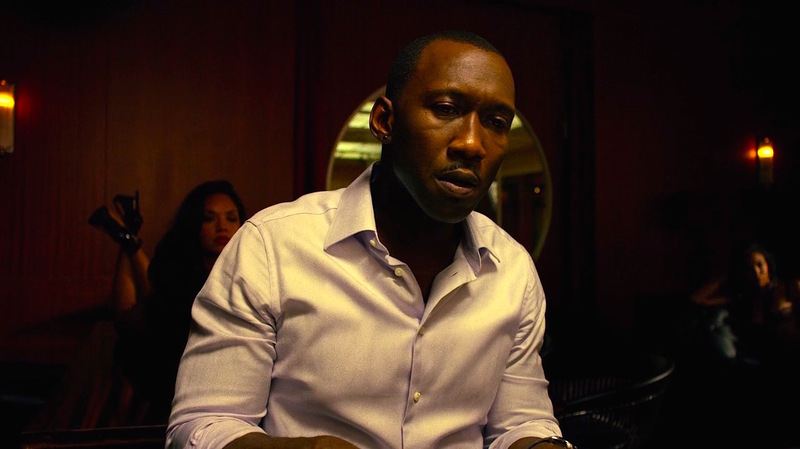 He also wears small silver emerald-set earrings, adding the small touch of green that Maslansky likes to incorporate into Cottonmouth’s wardrobe per her interview with Forbes. 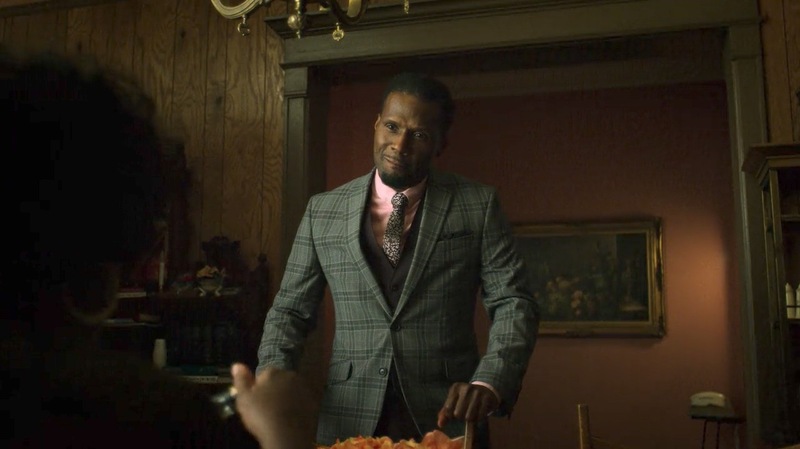 Interestingly, a flashback to Cornell’s youth in “Manifest” (episode 1.07) reveals his abusive uncle “Pistol Pete” Stokes (Curtiss Cook) in a similar outfit consisting of a loudly checked gray jacket with a black odd vest, light pink shirt, and tie. The details differ, but the base similarities are too noticeable to deny that Cornell Stokes was sartorially – in addition to criminally – influenced by his late uncle. Cornell Stokes provides a fine template for layered business wear by adding an odd vest to his gray plaid suit. You like my Biggie photo? Me, too. You know what draws your eye when you look at that? The crown. Wanna know why? ‘Cause everybody wants to be the king.